One day, Pastor Timothy decided that he would try to start a church group in a village that had no Christians. 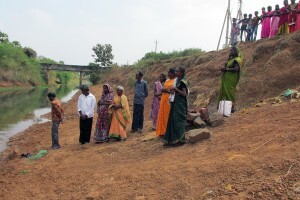 He and his wife talked it over and decided to try working in the village of Pudra Paka. They traveled there and began going from house to house. He took one side of the street and she took the other side, although it isn’t really accurate to call the little dirt trail a street. At each house they asked if they could come in and pray for the family. Every house gave them a very emphatic “NO! I am Hindu!” Thankfully, they didn’t give up, but went back week after week for three months with no success. Finally one woman told Pastor Timothy that he could come and pray for her family. They were so happy to find someone who was at least a little receptive! They started going to that house three times a week, praying for this woman and her family. 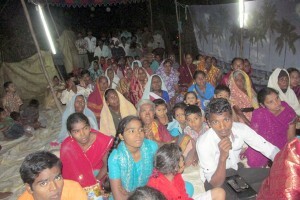 An Adventist meeting in Pudra Paka. After about another three months her neighbor came over during a visit. She said that ever since they had let Pastor Timothy and his wife into their house to pray, she could see that the Christian God had really blessed them! So, bit by bit, and very slowly, Christianity came into that village. After getting several families praying to Jesus, Timothy decided to see if the village would allow him to start a regular group worship every Sabbath afternoon. Pastor Timothy said to me, “Sometimes it’s better not to ask permission but just do it, and if no one stops you, then you are all right.” So, in 2001, a new tiny Seventh-day Adventist church was born in Pudra Paka. A few months later that year we held evangelistic meetings and baptized eight people who were ready at that time. The numbers attending church each Sabbath continued to climb. In a few more weeks we baptized six more members. Today we have around 50 baptized members, but twice that many attend, and most of them will eventually be baptized. 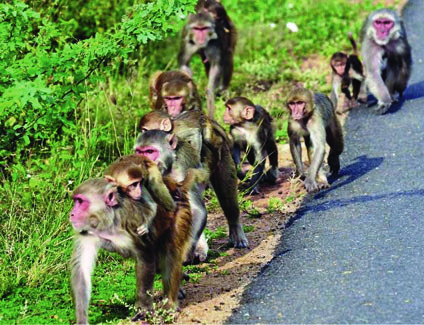 A troop of monkeys headed for Pudra Paka vilage. One Friday, a few weeks ago, word came to the village that the monkeys were headed that way. No one likes the monkeys to come to their village! 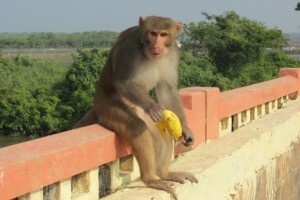 The monkeys take any food they want, including the fruit from the trees, and anything growing in the fields. The monkeys come in a troop and sometimes there are several hundred of them. They are very vicious and do not hesitate to tackle anyone who opposes them, unless that person is carrying a big heavy stick. When the monkeys come, everyone goes to their fields to try to protect them as much as possible. The villagers came to the Adventists and told them that they had better forget the Sabbath this week. They had to fight the monkeys and protect their fields. The Adventists had their regular Friday night meeting, and discussed what they thought they should do. They all knew very well what the monkeys were capable of. They decided to have a season of prayer and ask our dear Lord what He wanted to do. After quite a lengthy time of prayer they all came to the conclusion that they should keep the Sabbath and go to church, just as they always did. God would protect their fields and houses. One big male was enticed to come out to have his picture taken, by offering him some bananas. On Sabbath morning, all of the other villagers made sure that everyone was armed with a good stout stick. That was when they realized that the Adventists were not going to go to their fields, and they wasted no words telling them what they thought of them! They told them if they got hungry during the winter because the monkeys had destroyed their fields, not to come and ask them for help, because they would not help them! Some of the Adventists started to waiver, but most of them had made up their minds, and nothing the other villagers said made any difference to them. The strong ones encouraged the weak ones, and they all went to church. In church they all prayed about the situation and claimed God’s promise in Malachi 3:10, 11. They reminded the Lord that they had been faithful to return their tithe, and claimed the promise that God would rebuke the devourer for their sakes. Suddenly, each one felt a wonderful peace in their hearts, and they knew that God had heard them and would take care of the monkeys! They had a wonderful song service, followed by a very spiritual Christ-centered message. They had brought food, so they could spend time together with their fellow believers that day. Group of people waiting to be baptized. This brings the total baptized membership to 58. When they returned to their homes, they could see that the monkeys had left them completely untouched! As the sun was going down on that peaceful Sabbath day, the other villagers started straggling back into the village. They were very tired and discouraged. They had fought the monkeys all day and still some of their fields were damaged. Several of the Adventists decided to go to the fields before it got dark, to see if God had kept His promise. When they got to the fields they were overwhelmed with happiness and joyful hearts. Not one of the fields of the Adventists had been touched by the monkeys! They ran back to the village and shared the good news with the other Adventists, who in turn went to their own fields to see for themselves. The elder of the church called a special meeting of thanksgiving to their dear Lord, for honoring their faith in His protective power! The next day, none of the other villagers reproached them for keeping the Sabbath. Even though they fought the monkeys some of their fields and homes had suffered damage. The Hindus started asking the Adventists how they could have so much faith in a god they couldn’t see? Since that time we have baptized 14 new members. Quite a few more are taking studies and faithfully coming to church every Sabbath. Since that time the other villagers have apologized to the Adventists for telling them they wouldn’t feed them if the monkeys destroyed their fields. The Adventists then told them that if any of them ran out of food, they would share the blessings that the great God of Heaven had given to them. The Seventh-day Adventist church is the only Christian church that will ever be allowed in that village! At this particular time we are collecting funds to build a new church in Pudra Paka. We can build a nice church that will seat over 150 people for about $5000. That’s a bargain! If anyone feels moved to help in a financial way with this church, send your tax-deductible donations to: Eden Valley Institute, 9325 World Mission Drive, Loveland, C0, 80538. Be sure to mention that the donation is for building a new church in Pudra Paka, India. By Roger and Barbara Stone.